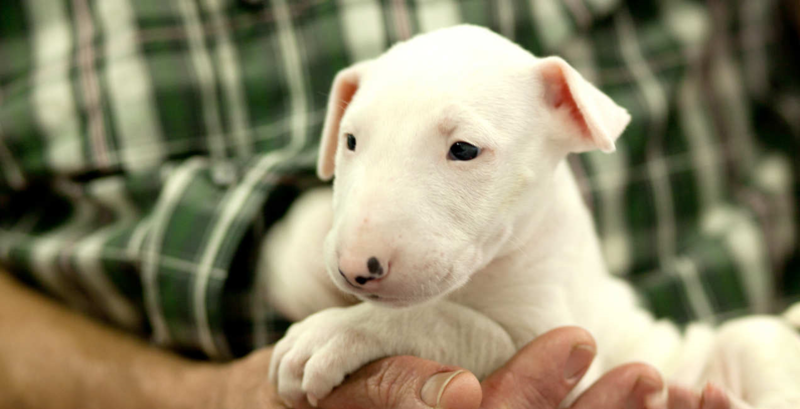 One of the most essential things for bull terrier pups to learn when they go to their new home is house training. This will require a great deal of consistency and diligence to achieve, but it will be well worth the effort for the happy years ahead with your new companion. Effective approaches to house training include crate training, paper training, and frequent trips outside. Dogs are natural den animals that keep their living space clean, making an appropriately sized crate a phenomenal training tool. Your puppy should be in a crate that allows them to lie and turn around as needed, but not large enough to give them a place to potty. Create or buy a partition for your crate while your puppy is growing to get the right size for them. Puppies will let you know they need to eliminate by whining or scratching at their crate door. It’s essential that you respond immediately to these cues and take your puppy outside right away—you may even want to carry him outside for the first little while—so he doesn’t mess in his crate and become used to pottying inside. Place your crate somewhere you can hear your puppy at night time so you’ll be able to take him outside. Using the puppy pad option for house training bull terrier pups can seem like a confusing concept, since the idea is for your adult dog to only potty outside. However, for those who aren’t home often to the let their dog outside, or for places with brutal winters, creating a designated indoor potty area using puppy pads can provide a solution. Often, this method is employed during the puppy stage and discontinued after the puppy matures enough to reliably do his business exclusively outdoors. Be sure to watch out for anything around the house that may resemble a puppy pad in color, size, or placement, as puppies will probably have a hard time discerning between a white shirt and a puppy pad. A puppy’s anatomy is tiny, and food and water enter and exit incredibly quickly—often more quickly than owners think. The rule of thumb is that puppies are able to control their bladders for as many hours as they are old in months, up to the nine-month mark. So, you may expect your five-month-old puppy to be able to hold their bladder for roughly five hours, though all puppies are different. Upon waking in the morning and before going to bed. After (or during) play time. After being let out of the crate or waking from a nap. When training a puppy to do anything, especially house training, consistency is everything. This means keeping a constant awareness of your puppy’s activities and diligent proactive trips outside to prevent soiling in the house. Spending time observing your puppy will help you get accustomed to your puppy’s behavior that immediately precedes elimination, so you can respond appropriately.